5 Homebirths, Hypermesis Gravidarum and Seeing Your Challenges as Gifts including birthing my last child at age 40 at home who was over 11 pounds with no tearing! TheThoughtHackers: 5 Quick and Simple Techniques for Healing Trauma at Home. We talk about Jennifer’s book, Understanding Your Child as a Spiritual Gift. This book leads to Awareness, Connection and Authenticity! When I planned our trip to Panama to visit my mother-in-law for six weeks, I never imagined I would be experiencing the extra bonus of reliving the 1970’s with my children—a bit like visiting an intergenerational theme park. Nostalgic moments filled our rented house as I talked on the telephone attached to the wall, twisting the long coiled cord around my index finger. As I taught my children the art of adjusting the T.V. antenna to get a clearer picture, I half-heartedly hoped the fuzz would not appear during an important scene, but squealed with delight when it did because it was another chance to share a glimpse of my childhood with my kids. With only four T.V. channels, my kids would look forward to whatever cheesy special was advertised for the next day, even though the shows were in Spanish—a language they did not understand. There were no remotes so we would lazily negotiate who had to get up next to change the channel. As we watched the 2012 Olympics on this primitive color TV, we failed to realize that Gabriella’s leotard was not the color we thought until we caught a glimpse on the neighbor’s newer analog television. Without reliable electricity, the kids needed to rely on playing with each other and the neighbors. One thunderstorm-filled afternoon, my daughter and her new neighborhood friend ran back and forth between houses gathering ingredients to make cupcakes. They sat cross-legged on the kitchen floor relishing in the simplicity of watching their cupcakes rise through the oven door. Even though I welcomed the gift and surprise of living with a touch of the seventies with my kids, many defining Generation X moments were not captured in Panama, such as sitting in my fourth-grade classroom in dismay as I watched the Space Shuttle blow up, receiving the news of President Reagan being shot, getting a microwave and home computer, playing Atari and watching MTV. How do these experiences compare with Generation Y growing up with massive school shootings, the aftermath of 911, the birth of Facebook and the iPhone and all the fear and confusion, yet global access that these events provide? No one really knows the answer to that, but we do know that each generation of parents struggle in some areas and thrive in others. For Generation X, parents seem to struggle the most with how to control access to media. This is especially challenging as schools start to integrate technology into the classrooms. Many of us spend excessive time unsuccessfully trying to control our children’s media consumption while many other parents give up and look the other way, buried in our own media addiction. Some of us search furiously for apps that restrict our children’s media access. I have yet to find something that covers all the bases while allowing a child to complete their homework assignments and be able to maintain their social connections. Regardless of your view on media, all parents wish for their children to grow into happy, functional, and flourishing adults, which I believe is what parents of every generation have always wanted for their children. Generation X parents fall down most when it comes to using scheduled playdates.These playdates with the added endless after-school activities put our kids in controlled environments with so many time constraints, leaving them with too little down time and the inability to develop trust in themselves and learn how to solve unexpected problems. Lenore Skenazy, author of Free Range Kids, reports that violent crime is down from the 1970’s, yet we allow excessive media to fuel our paranoia as we surrender to the litigious nature of our society. On the flip side, Generation X parents thrive when we invest in our children’s feelings, asking our kids what they feel and teaching them to express themselves. Although Generation Y is spoiled with instant photos and the expectation of constant entertainment, such as jumpy houses at virtually every event, they are growing up with a sensitivity to the underdog, witnessing many triumphs for them, such as the legalization of gay marriage and the rise of a global community. To conclude, I want to apologize to the Millenials and Generation Y for whatever part I played in the mess of environmental and political disasters created and reinforced by the Baby Boomer and Generation Xers. I trust that your generation’s team playing skills and underdog advocacy will help resolve these tremendous challenges. As I wrote this article, I fantasized about a Generations theme park where we immerse ourselves in the paraphernalia of our own generation and fully explore other generations. Comment below about how you parent differently than your parent’s generation and what you would like to see in such a theme park. 7 Easy Steps to Embracing your Child’s Tantrums as a Gift. Thank goodness I discovered the connection between my husband, Rob, and my daughter, Arcata. If I hadn’t, we would still be living in chaos, controlled by those invisible, unconscious moments that happen so frequently between a parent and child. Arcata screamed for the first three years of her life, rarely slept, and totally exhausted our family. As my husband slowly started to respond to her tantrums as messages alerting him to become more authentic, she stopped ruling our lives with her constant outbursts. In fact, what we realized was that Arcata was channeling Rob’s unexpressed feelings and that she’d continue to act them out through unwanted behavior until he expressed the feelings himself. One night as bedtime was approaching, my daughter’s eyes began to glaze over and she yelled, “Get out of here! I want you to leave now!” to our dinner guest. Our guest had previously suggested to my husband that she leave because bedtime was nearing, and my husband had assured her that there was no reason to leave. When Rob finally expressed himself and told our guest to leave, Arcata instantly transformed into a calm, peaceful spirit. After numerous experiences like this, we realized she was a gift here to show my husband that it was safe for him to express himself after 42 years of being codependent and people-pleasing. Not only did Arcata verbalize my husband’s words, she also manifested situations that resembled my husband’s unexpressed struggles. Arcata continued on and on about how difficult it was that she had to go to so many stores to look at pianos. Her older sister and I were so confused because our family never shops for pianos. I called my husband to find out what was going on with him—a habit that has calmed Arcata many times. He explained that a teacher was demanding that he hook up her printer and fix her computer. He had a class to teach and was having trouble setting a boundary. As a result, Arcata was feeling the pressure that he did not feel comfortable expressing to the teacher. After he expressed himself to me, Arcata began to talk about how excited she was to make origami for an upcoming craft fair when she got home. One minute she was strangely obsessing about shopping for pianos and suddenly she switched to her excitement about making origami. As we scrambled to figure out how to stop the channeling, I drilled him to uncover what he was not expressing. Then I learned that the issues were sometimes very deep. He began to embrace long-term healing techniques such as Emotional Movement Desensitization and Reprocessing (EMDR)—a simple trauma release technique that teaches your brain how to respond to situations from both hemispheres of the brain. During trauma, we lock into the dominant side of the brain and fail to send messages through the corpus callosum (the tube inside your head that connects the two hemispheres of your brain). We taught my daughter about the corpus callosum too. When we explained this to her, she responded that there was a little man inside the tube that got stuck in the tube when the channeling was occurring. She began to nudge the little man when she noticed she was experiencing feelings that belonged to her dad. In addition to using visualization to nudge the little man along, she would also simply ask her dad to feel his stuff so she did not have to. This empowered her to take control of her overwhelming feelings and release her from the channeling. Discovering the channeling connection is an opportunity for a parent to get to know what is inside herself. When a child is released from feeling a parent’s feelings, she can more easily tap into her own creative energy. To find out which parent a child channels, look to see which child acts and/or looks most like which parent. Here’s a list of how to proceed with the channeling theory in action when challenged with a tantrum. Encourage the channeling parent to work through these steps. 1. Stop. Do not focus on the child, instead realize her difficult behavior is a message for you to reflect on issues within yourself or your partner. 2. Look for issues or themes within the tantrum to decipher the message. 3. Apply those issues or themes to yourself and think about what is not being expressed in your world. Often a channeling parent thinks she is fine and that she has expressed everything. Remember the child’s tantrum is a message to dig deeper to find your authenticity. 4. Find ways to genuinely express what is occurring inside. Simple actions are enough—call a friend, journal, punch a pillow or punching bag, scream outside, or pretend to argue with someone who is not there to express what is stuck inside. 5. Observe how your child calms down and often creates or happily engages with others after you have genuinely expressed yourself. 6. Take note of re-current themes for the future. Record the patterns. 7. Thank yourself for doing some awesome parenting. Now my daughter’s tantrums are rare. When they do occur, a quick check-in with Rob’s thoughts are enough to remind him to express himself. Once he does, she no longer acts out. Our discovery has resulted in a great sense of relief for our family and the ability to thrive without being controlled by the chaos of an unpredictable child. Reprinted with permission from The Homeschooler, a publication of The HomeSchool Association of California (www.hsc.org), a non-profit organization providing broad support to homeschooling families, and protecting homeschool freedoms through monitoring and legislative influence. Not even a week after the Maker Faire Bay Area 2012, I was still creating almost non-stop. 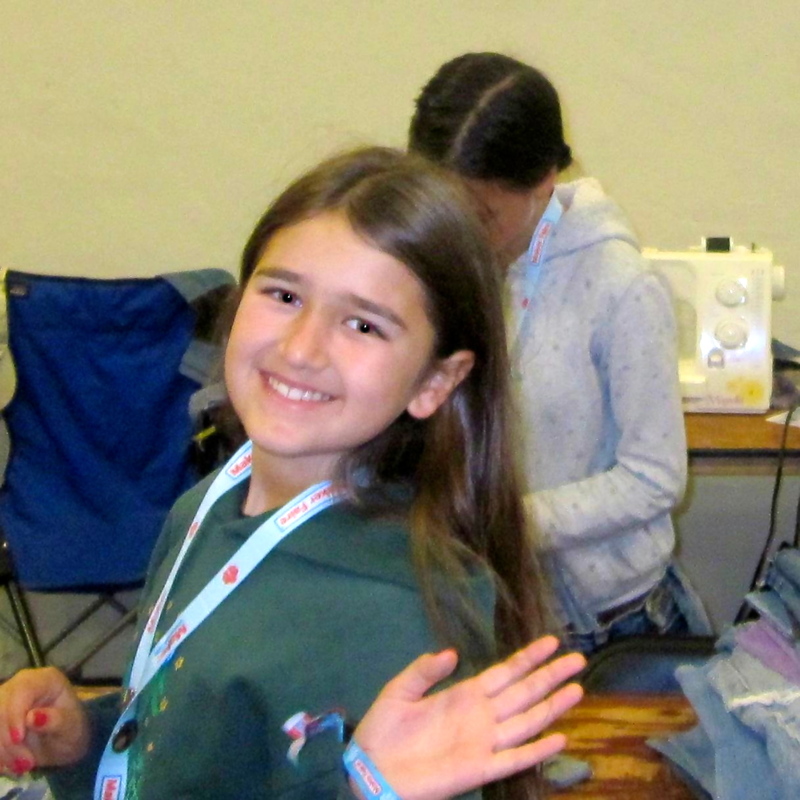 I attended my first Maker Faire in 2009 when my daughter Cedar was 8 years old. She said, “The next time I come back here I am going to be a maker.” The next time she returned to the Bay Area Maker Faire at age 10 years, she was a maker. In the summer of 2010, an adult at park day told us about the first Mini-Maker Faire in Oakland and suggested Cedar apply. She decided to teach people how to make jean purses. Cedar loved teaching at the Mini-Maker Faire. Her booth was so successful that decided to teach at the traditional Maker Faire 2011. Make was so impressed with her work that she won the 2012 Editor’s Choice blue ribbon for her “Make A Jean Purse” booth. All along, I supported her organizationally and learned so many sewing, fundraising, and business intuition skills from her. Because Cedar is self-taught on the sewing machine, it was easy not to get too involved. I cannot even change the bobbin on the sewing machine. I have finally learned to thread the machine and enjoy hacker-sewing as long as she is there to help when the machine breaks. Thanks to my daughter I have found my inner maker. See, I am not particularly skilled at arts, crafting, building, electronics, or computers-traditional maker areas of expertise. However, in the true spirit of a maker, I have tried them all and am getting better at them every day. I have also realized how much of a maker and hacker I am in my everyday life. For example, I have hacked alternative health (DIY acupuncture), and make community happen (hosting block parties and networking). I’m awesome at orchestrating makers and helping to make things happen. I am also a doer, and I love to see people make. My husband, Rob, is also a maker and an inspiration. I encouraged him to apply to the Maker Faire this year since to promote his ideas for integrating free technology into underfunded schools. It turns out the makers are much more ready for his innovative ideas than the teachers at the exclusive East Coast conference where he previously presented. With so creative energy flowing around my house, I constructed a “Home Hacker Calendar.” I wrote down 365 ideas in 12 categories: Crafts, Building/Design, Electronics/Computers, Recycled/Conserve, Random, Make Community, Hack Alternative Health, Create Fun, Arts, Household/Health Products, Fix-It, and Food. 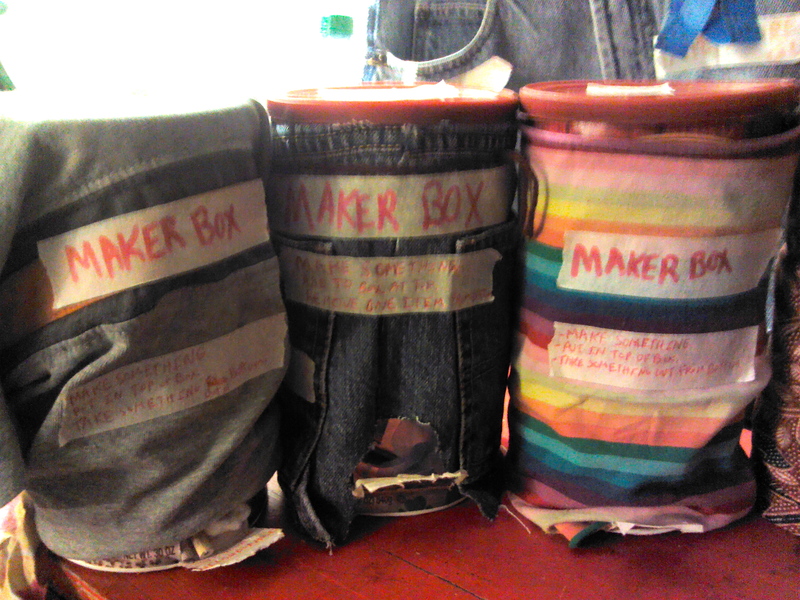 I want to see if I can make every day and keep the Maker Faire energy flowing. Can a calendar help inspire me to make every day? Can I help beginner makers adopt the maker consciousness? Can I help our culture move away from the need to be an expert or ask the advice of an expert? Can I help people learn skills (tricks of the trade) in all areas of making? Inspired by an idea that I heard about at the Maker Faire Bay Area 2011, I’m creating boxes where people can exchange ideas for making. The original version of this concept was a gumball machine of sorts where you exchanged wishes. My plan is to place these boxes across the country in libraries, hospitals, grocery stores, and independently owned shops. By the end of the year, there should be boxes from California to Maryland and as far south as Panama. Through my Home Hacker Calendar and Maker boxes, I hope to spread maker consciousness. My daughter Cedar inspired all of this! Trust your child. Trust yourself. If they are making, creating, hacking, and doing, leave them alone. They will find their way. Do remember the things they mention most often and what they are most proud of accomplishing. If they’re headed to the Maker Faire, gently remind them of deadlines and fill in those parts where they need help. Do not take over. If you don’t know their craft, find people who do and direct your child to them. Enlist their friends to help as they can be lifesavers for both you and your child. Jennifer Griffin lives in Berkeley with her four lifeschooled children & wonderfully supportive husband. She enjoys urban foraging, hacking alternative health, and crafting through intuition.